Josh Sippie takes a look at highly-rated Arsenal academy striker Eddie Nketiah. Arsenal’s youth ranks are always going to be full of players to watch. Even when they go and sell a chunk of those players, they are one of the more renowned academies in the world and with Arsene Wenger always on the lookout for new and inspiring talents, these youngsters know they need to be at the top of their game at all times because someone else could be along in a heartbeat to replace them. Eddie Nketiah shouldn’t have too many concerns about who may be coming, because he has been such a good striker for the Arsenal youth outfit that he has forced his rivals (Donyell Malen) out of the club, as no one else can seem to keep pace with his ability to score goals. Eddie Nketiah began his footballing career when he was spotted by Chelsea playing for a local team in London. They locked him up at the age of nine and he spent six years playing in their youth system before being told in 2015 that he would be released. It took Arsenal just a couple of days to invite Nketiah to training and just a week after that for him to sign a professional contract with the Gunners. They clearly knew what they were doing. Since then, Nketiah has been shooting (and scoring) up the ranks within the Arsenal system, showing the world why he was so highly thought of in the first place. Nketiah just knows how to score and he has shown this at every level and at every opportunity. With the U18s, he proved to be too much to handle, as his hot foot accounted for 24 goals and five assists in just 28 appearances in his first season with the club, including two hat-tricks. He closed out the season averaging over one goal every ninety minutes, in just his his first year with his new club. The new season is off to as quick a start, as he was one of a handful of youth products selected to go on the preseason tour with the first team and the quality was displayed at the first team level as well. He showed more work ethic than most of the first teamers and displayed a competitive streak to die for. 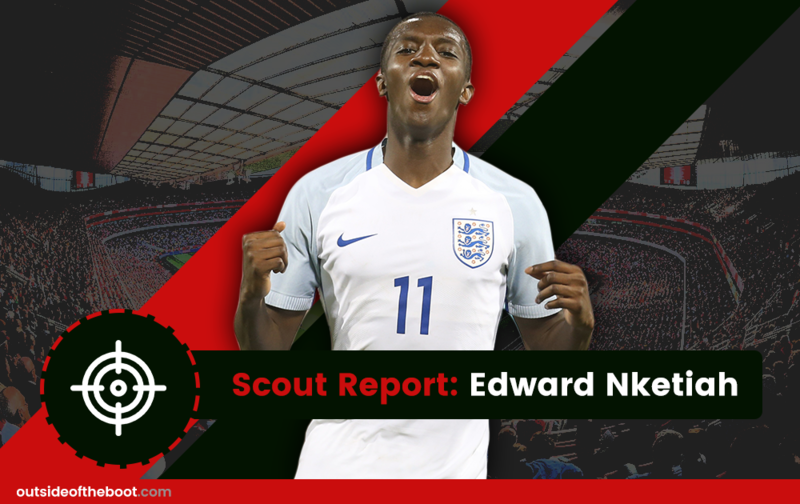 Internationally, Nketiah has touched down at the England youth side and has made several appearances for them but he can still represent Ghana or the Three Lions at the senior level. There is just one phrase that one would use to describe Eddie Nketiah’s style of play and that is simply an “eagerness to score.” The term “fox in the box” also comes to mind when you see him play, because he simply has an insatiable desire to smash the ball into the back of the net. However, unlike some people with that desire, Nketiah has actually proven capable of doing so. Nketiah is a strong dribbler as well, capable of needling through tight spaces with the ball at his feet. This, coupled with his intense work ethic which stems from his eagerness to score, extends Nketiah’s usefulness outside of just the box. He has also been used out wide to great effect, as he has such a strong engine that he has no problem tracking back to defend and pushing forward from deeper positions. Yet it must be said again that for all of the stylistic points he gets for his dribbling abilities, work ethic and any other skills that may develop, Nketiah’s style of play lives and dies with his ability to finish. In case you haven’t picked up on it yet, let’s say it one more time- Eddie Nketiah is a finisher in every sense of the word. This is his primary strength and it’s actually crazy how strong (for lack of a better word) this strength actually is. Even in Arsenal’s academy system, which had, until recently, boasted the likes of top Dutch product Donyell Malen, as well as long-time Arsenal starlet Stephy Mavididi, there is no one who has ever come close to Nketiah in terms of scoring and this year it is looking like the same. He has such an appetite for goals and a pure finishing ability that he makes it look easy, like it’s something he does for fun. For an Arsenal club that has been starved of quality finishers for a good decade or so, there should be a steady advancement in the future for this young man. Nketiah is also a strong dribbler, which couples well with his fantastic work rate, giving him the ability to penetrate defenses well enough on his own where he can set himself up for more scoring opportunities. Naturally, Nketiah’s speed is another strength of his. He can scamper away from most defenses, which adds to the usefulness of playing him out wide. With more space to roam, he is able to exert more of an influence as opposed to just waiting for over-the-top balls or opportunities to latch onto through balls and be in on goal. Still, Nketiah is a striker first and foremost. His ability to finish is so strong that he may be one of those rare talents that only needs this one strength to be successful. With such a specified crop of skills like Nketiah has, you don’t tend to notice the weaknesses as much, but they are still there. His control is the only big issue for Nketiah. While he has control in front of goal when it comes to putting the ball past opposing keepers, he doesn’t always have control when a shot isn’t there for the taking. Simply put, Nketiah can get a bit too eager. He is a great dribbler and his main prerogative is to score. It only makes sense what his directive is going to be- get through anyone that may be in the way using his dribbling ability and then have a whack at the ball, which usually results in a goal. The problem with that is that he is so hungry to score that he can get a bit out of control with his dribbling and get too ahead of himself. This is only a weakness in terms of the end result, because you can’t fault a young man for being eager to score goals. There just needs to be a bit more control introduced to his on-the-ball work. Josh Sippie is a Yank who lives in New York City and follows all football (the real kind) religiously. He is a diehard Arsenal supporter and has found a practical use to his tortured fandom by serving as the site expert of the aptly named “Pain in the Arsenal.” He despises flopping and is proud that his fellow Americans are finally getting the picture and taking football (the real kind) seriously.